All I can say is "YUM"!! 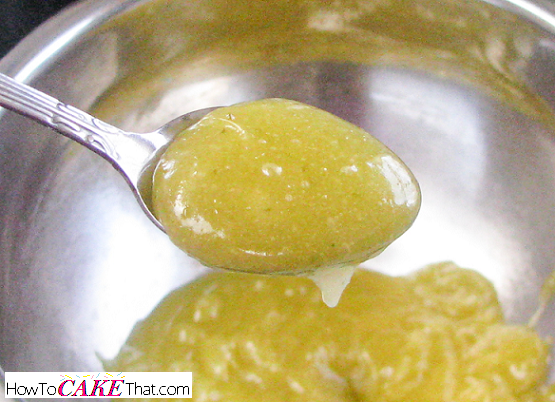 This is the best key lime curd recipe I've ever tried!! It's not too tart, it's not too sweet... it's perfect!! It tastes just like my favorite key lime pie recipe!! 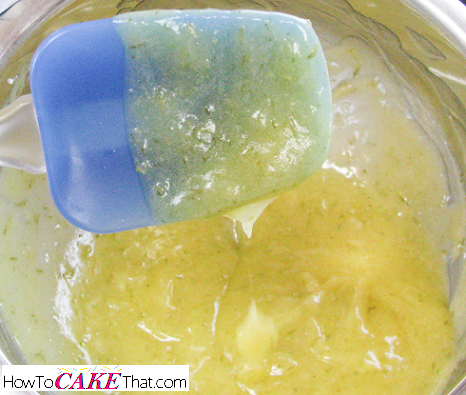 This key lime curd is the perfect filling for a key lime cake, or key lime cupcakes! Hope you enjoy!! Note: Recipe can be doubled or tripled! 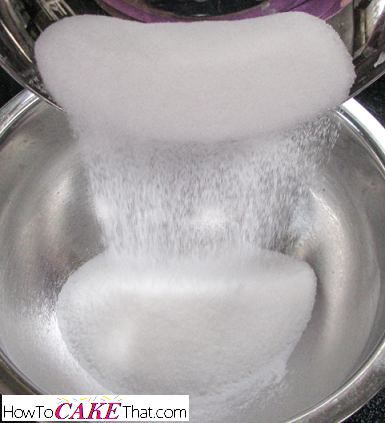 To begin this recipe, pour 6 ounces of granulated sugar into a metal mixing bowl, or the top pot of a double boiler. 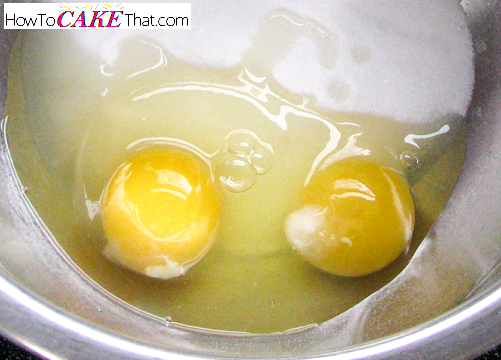 Next, add two whole eggs plus an extra egg yolk (not shown). 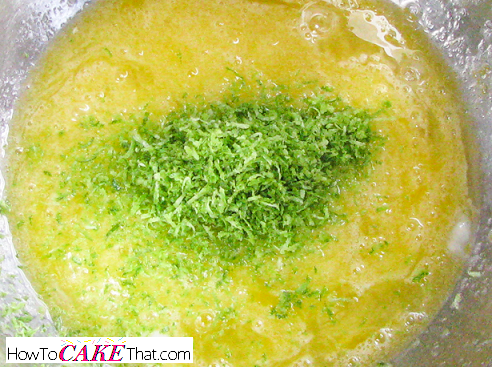 Add the lime zest to the egg and sugar mixture. Now for the really good part - 3 ounces of key lime juice! The level of quality of this ingredient is very important. You can either choose to use the juice from fresh key limes or regular limes, or you can choose to use a bottled key lime juice. 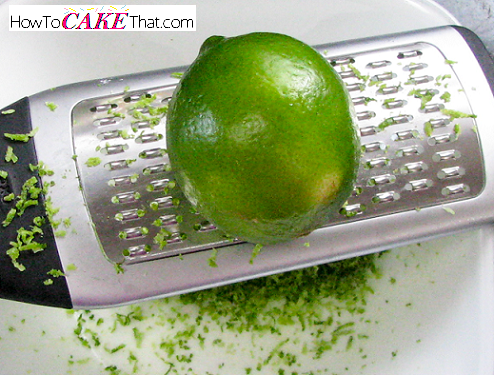 For this recipe I am using Nellie and Joe's 100% natural bottled Famous Key Lime Juice. I highly recommend this brand if you are choosing to use bottled juice. 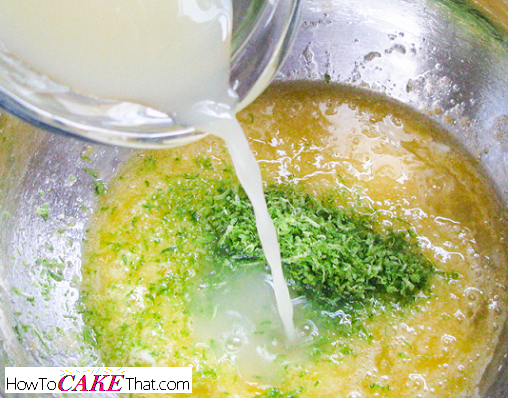 The quality of the juice will make all the difference in this recipe. 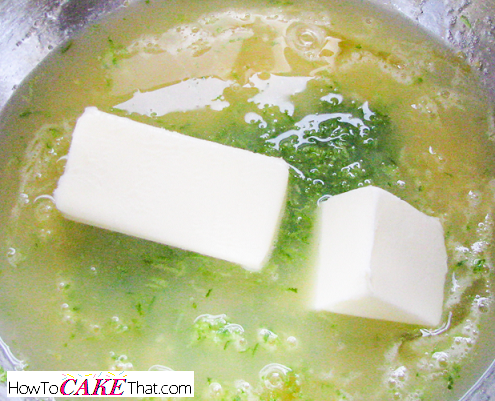 And lastly, add 3 ounces of unsalted butter (6 tablespoons). Now it is time to heat our ingredients over a double boiler. 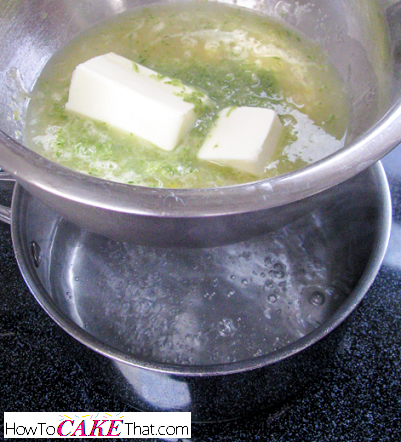 To simulate a double boiler, I'm placing my metal mixing bowl over a pot of simmering water. 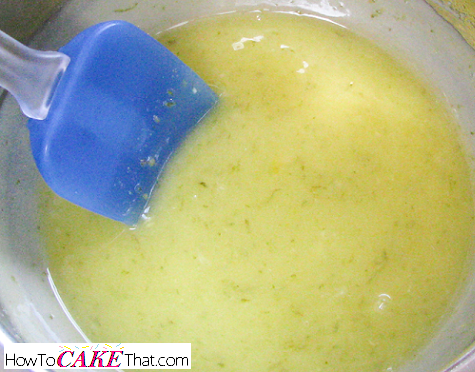 Stir curd constantly until thickened. This can take about 20 to 25 minutes. For a smooth, creamy curd, strain curd through a mesh strainer placed over a clean heat-safe bowl. 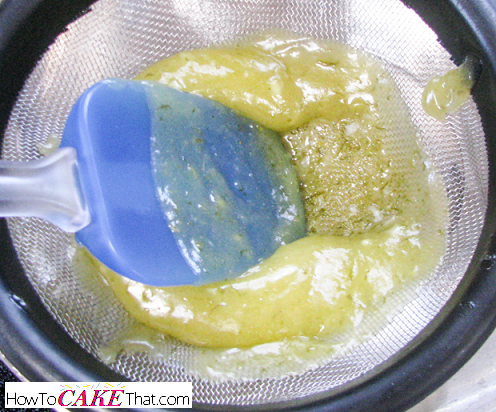 Good thick curd will not easily pass through the mesh. Help it along by using the back of a rubber scraper to push it through the mesh. Allow curd to sit in heat safe bowl until it is no longer too hot. It should feel warm but not hot to the touch. 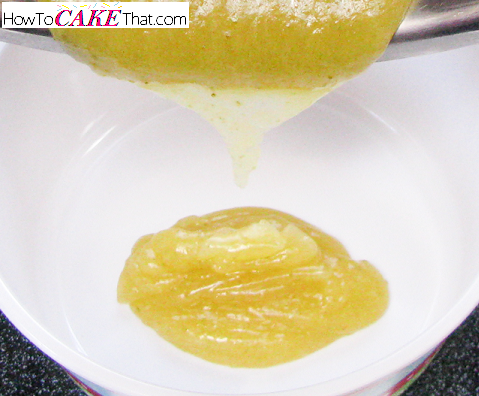 Once curd is no longer too hot to touch, pour the curd into a storage container. 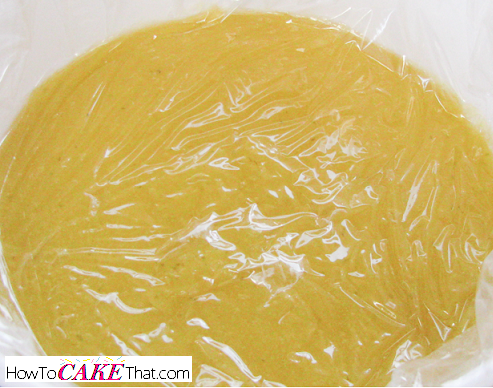 To protect the curd from forming a "skin", place a piece of plastic wrap directly on the surface of the curd. Place a tight-fitting lid on the storage container and place curd in the refrigerator for one week, or until ready to use. 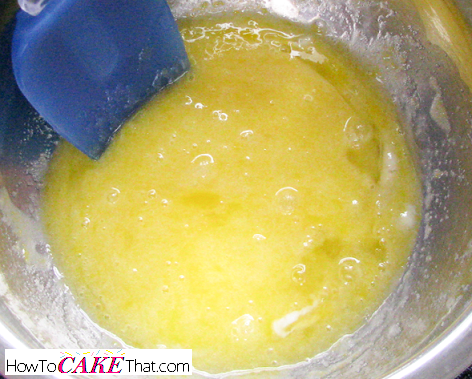 Or the curd can be frozen for up to 6 months. 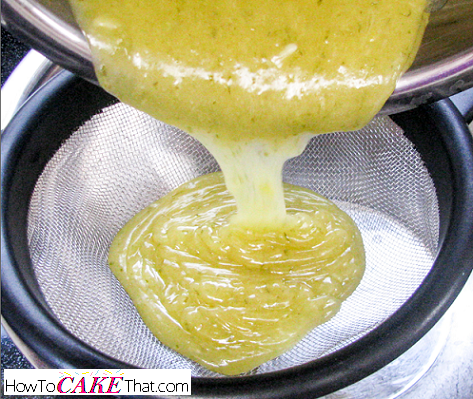 And that's how you make my absolute favorite key lime curd recipe! Now I've got to make some key lime cake to go with it! Mmmmm... delicious!! I hope you have enjoyed this tutorial! God bless!